From Superman Family #165 comes an eclectic collection of graphic related merchandise. 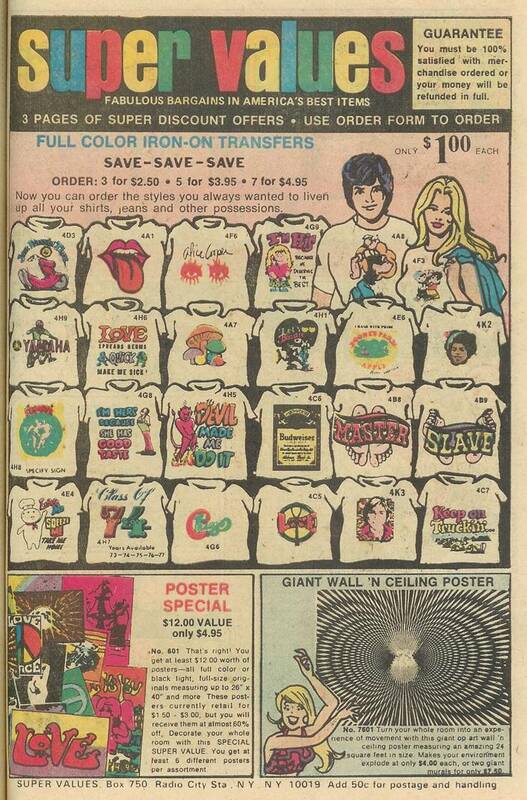 I’ll admit that some of the T-shirts are interesting (is that Michael Jackson?). Some of them make little sense to me, like why advertise your magic mushroom use? Or that you’re a slave? But what really got my attention is the bottom right hand corner, and the fact that Betty from Archie Comics fame is shilling a gaudy, headache inducing poster. Guess times were tough all over back in the 70s. Wonder if she knows Archie’s going to dump her and marry Veronica?